2. How many of this item should be in each shipment? 3. The first shipment of this item will be sent once you place this order. Breakthrough Hair Regrowth Treatment for Men with 10% Trioxidil® + DHT Blockers Designed to Treat Hair Loss and Promote Scalp Health. Say goodbye to hair thinning and hair loss, say hello to new, healthy hair. The easy-to-apply FOLIGAIN Hair Regrowth Treatment For Men is formulated with our most potent 10% Trioxidil blend for fast, visible results. 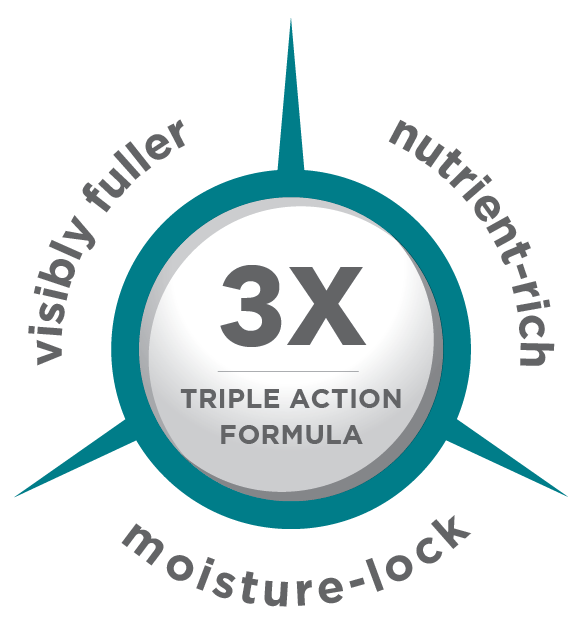 Trioxidil is formulated to target the main causes of hair thinning for added density, fullness and youthful vitality. Thinning ceases and allows for new hairs to grow and create a whole new head of hair. Male Pattern Baldness occurs when enzymes called 5α-reductases convert healthy testosterone to Dihydrotestosterone (DHT). DHT causes hair follicles to shrink and the growth phase to shorten. Blocking DHT from the scalp it the key to ending hair loss. The next thing you need is a product with the proper ingredients to promote circulation to the scalp, increasing hair growth. The final thing to look for is nutrients to feed the healthy and new hair follicles, so hair will be healthy. Liposphere micro-emulsion technology infuses hair and scalp with our exclusive 10% Trioxidil complex to regulate cellular nutrition, strengthen extracellular matrix proteins, control inflammatory responses, reverse damage caused by DHT, and condition hair for the anagen or growth phase. Our formula also contains hair strengtheners such as Biotin, and is boosted by Trichogen™, Procapil™, copper peptides and pea sprout extract for a truly comprehensive solution. These ingredients have gone through rigorous testing and research to ensure the best support for hair growth, scalp health and follicle health. 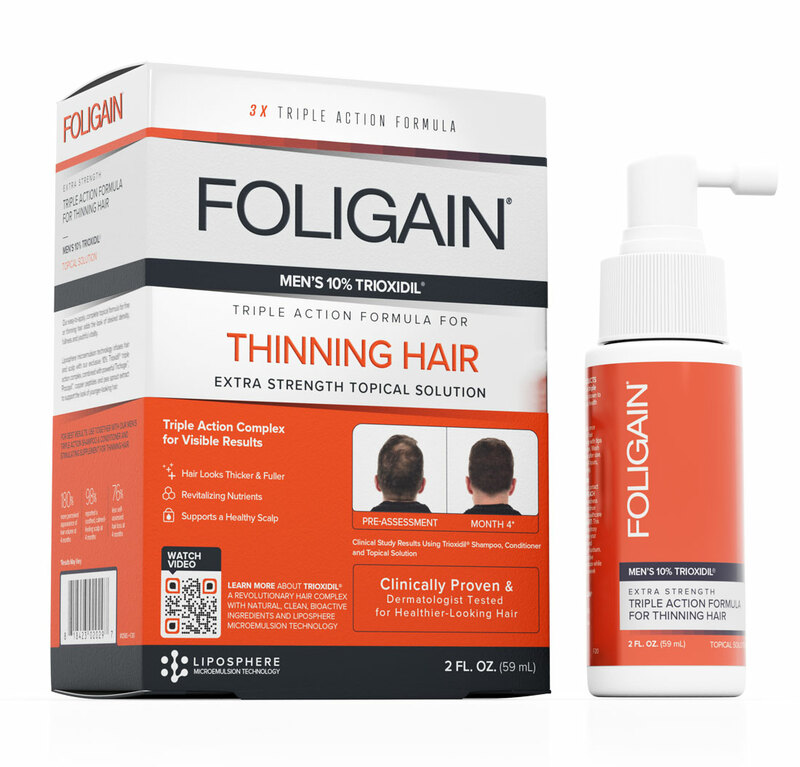 Only FOLIGAIN contains Trioxidil, a triple action anti-thinning complex developed by a team of hair care experts, with bioactive ingredients clinically shown to help revitalize hair and scalp health. Helps to boost necessary proteins for hair that’s denser and full of body. Proteins are a key element in hair health, providing nutrients to create a shiny, thick head of hair. When each hair follicle is bombarded by the right kind of protein, hair is rejuvenated, creating a more youthful and healthy look. Bioactives target the main causes of thinning, helping to fortify follicles from within for younger-looking hair. Thinning subsides quickly and is replaced with regrowth and replenishment! A healthy scalp provides the right environment for better hair. Moisture-lock technology seals in nutrients and skin moisture to help reduce irritation and provide a healthy base for new, healthy hairs to grow. Use together with our FOLIGAIN Hair Regrowth Shampoo & Conditioner For Men, and FOLIGAIN Stimulating Hair Regrowth Supplement. May also be used with FOLIGAIN FOR MEN Minoxidil 5%. Ingredients: Propylene Glycol, Aqua, Butylene Glycol, Dextran, Acetyl Tetrapeptide-3, Trifolium Pratense (Clover) Flower Extract, Polysorbate 80, Glycerin, Hydrolyzed Jojoba Esters, Citric Acid, Panax Ginseng Root Extract, Arginine, Acetyl Tyrosine, Arctium Majus (Burdock) Root Extract, Hydrolyzed Soy Protein, Polyquaternium-11, PEG-12 Dimethicone, Calcium Pantothenate, Zinc Gluconate, Niacinamide, Ornithine HCl, Citrulline, Glucosamine HCl, Biotin, PPG-26-Buteth-26, PEG-40 Hydrogenated Castor Oil, Apigenin, Oleanolic Acid, Biotinoyl Tripeptide-1, Lactic Acid, Milk Protein, Copper Peptide, Aloe Barbadensis (Aloe Vera) Leaf Extract, Allantoin, Pisum Sativum (Pea) Sprout Extract, Serenoa Serrulata (Saw Palmetto) Extract, Equisetum Arvense (Horsetail) Extract, Lecithin, Retinyl Palmitate (Vitamin A), Tocopherol (Vitamin E), Ascorbyl Palmitate (Vitamin C), Panthenol (Vitamin B5), Phenoxyethanol. Apply 4 sprays to the scalp once daily directly to the area of hair thinning. Massage into scalp with tips of fingers for several minutes. Wash hands with soap and water after use. Leave on scalp for at least 4 hours, but can be left on indefinitely. Warnings: For external use only. Avoid contact with eyes. KEEP OUT OF REACH OF CHILDREN. If irritation, redness or discomfort occurs, discontinue use and consult a licensed healthcare practitioner. Read and keep carton for full product information. can see great improvement after a month of application. just apply once a day and forget for the rest of the day. super easy but effective. highly recommended! Easy to spread, teksture ok.
Been using it for over a couple of years now and it has slowed hair fallout but I use it with minoxidil to slow the back and top hair fall out. I haven’t seen much growth from the front but hair fallout has definitely slowed right down. Let’s hope I see new hair growth around my receding hairline soon as I’ve been using it for a while now. I have been using this product for some months now and the results are real and visible. I have tried most things on the market including Minoxidil and this product is far superior (without any side-effects). If you are in the early stages of hair loss this product would be a great choice, it will help feed existing hair follicles and reverse the damage caused to thinning areas. Please give this product a go, you will not regret it. Very satisfy with the shipment and the product!! im very satisfy with the product just been using 2 weeks now and started to see my hair looks thicker and fuller!! This is a tried and tested product that I have been using for some years and along with a well known oral product this topical product works well.